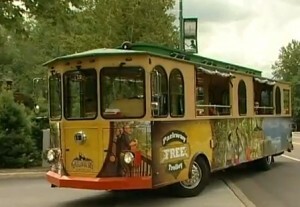 This summer in Gatlinburg a great hit is the Free Trolley on Parkway. The City ran a pilot test of this service last summer and it was very popular so it’s back again this year, running through August 18th. The free trolley runs between Traffic Light #1 at the Fairfield Inn on the north end of town and Traffic Light #10 at the entrance to Great Smoky Mountains National Park. Extra stops have been added so there are now 40 stops along Parkway on the free route. This is a great way to shop and explore what downtown’s main artery has to offer. The Gatlinburg trolley system is a class act, and the best way to get around most anywhere in Gatlinburg. The system stops at more than 100 locations (including Dollywood), covers 50 miles of roadway, and even includes a beautiful tour of the National Park. The trolleys are inexpensive, friendly to people and the environment, and high-tech: you can locate your trolley by GPS through your smart phone if you’re so inclined. Wheelchairs, baby strollers and bicycles are welcome on the trolleys. The trolleys are easy to find and get around in, with stops clearly marked and very visible. Even newcomers agree there’s nothing to be nervous about using Tennessee’s 5th-largest mass transit system. You’ll want to get the all-day pass for $2, which you can buy everywhere, but especially at the Welcome Centers and City Hall, where you can park for free. The Transit Center is at the Aquarium (traffic light #5), so all trolleys will take you there. And from the Aquarium there’s a lot of the town you’ll want to explore on foot. Gatlinburg is a compact walking town, and it’s full of amazing attractions, beautiful scenery and happy people all bustling around. This does mean that driving a car, and especially finding a place to park, may not be how you want to spend your time. So feel at ease and take the trolley where you want to go in Gatlinburg.